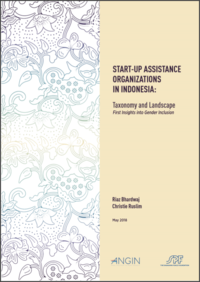 This report dissects and maps the landscape of start-up assistance organizations (SAOs) - defined as entities that offer a spectrum of support services to entrepreneurs and ventures at different growth stages to develop successful and viable businesses - in Indonesia, and provides first insights into gender inclusion in SAO programs in Indonesia. The first of a two-part series, this project first maps out the SAO ecosystem and provides more clarity in distinguishing features of available support programs. It identifies 53 SAO programs in Indonesia and classifies the programs into four main categories: incubators, accelerators, ecosystem builders, and other support programs.